Oats (even gluten free oats) are not tolerated by many what are gluten intolerant, and for those people, spelt is not an option. Is there any other substitute you can suggest? Hi PJ, That’s such a good point, thank you for mentioning! I haven’t tested any other flours, but I will certainly update the recipe if I do. I wonder if a good all purpose GF mix might work? Hi Angela! I wanted to say thank you for the delicious muffin recipe! I made it and absolutely loved them! When I made them, I substituted 1:1 sprouted quinoa flour and they still turned out really well. Hope that helps PJ in her quest for a GF substitute. These look delicious! Going to make a batch tomorrow using a pumpkin from our garden :) Thanks for your amazing recipes! So happy to hear that Nadine :) thank you! Hey Julie, Thanks so much for your comment! Does this mean that the “certified gluten-free oats” can still contain small amounts of gluten? I wasn’t aware of this, but I appreciate you chiming in! I’m sure it varies by the brand too. Not to create further confusion but just thought I’d add a note about oats I’ve learned recently. Oats do not naturally contain gluten (they can be become gluten “contaminated” if manufactured in a facility with other gluten containing grains) but they do contain gliadin which is another protein that people can be sensitive to. I was tested recently and was found to be intolerant to gluten and much more intolerant to gliadin. Anyway, this recipe looks excellent. I’ll have to give it a try – I’m sure a GF free flour blend would work very well. Hey Jacquie, that’s so interesting…thanks for sharing! I’d love to hear how it goes if you try a GF flour blend. I talked to my gluten-free husband about this and he said that the Bob’s Red Mill brand of gluten free oats is actually gluten free. The website says they test all the time and do what they can to segregate stuff. Hey Christine, Thank you for chiming in! It seems like there’s so much different information out there about it. Good to know! 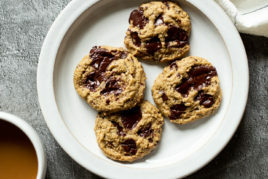 These look delicious and I want to try them, but my son cannot have coconut, so is there a different oil and sugar I am able to use to replace those ingredients? PS. Love this allergen friendly recipe! Hi Riley, Thank you so much for your thoughtful words! I’m sorry you’ve experienced something similar…but I can so relate that it brings back those feeling of restriction and messes with the mind. I hope you are on your way to feeling better these days! Made these over the weekend with regular whole wheat flour and they were great! My non-vegan husband loves them. Hey Kim, I’m so glad they worked with WWF…thanks for sharing! Did your bake time change at all? I baked them for 25 and they were perfect. Wow these look amazing! Thanks so much for sharing! Can’t wait to see what my kids think of them after school. I hope you get through to the bottom of your food allergies soon, it seems so unfair that someone who gives as much food love to the world as you do should be going through this :( Hugs. Thanks Anna :) I’m so encouraged by the progress I’ve made in a couple months…so happy to be feeling better than I was! Looks yummy, can’t wait to try these maybe today😊! The muffins look delicious and your words ring very true for me. I struggle with severe IBS and have also been recovering from anorexia. My recovery has been so much harder because of all the issues with my gut. I would really encourage you to check out thereallife-rd.com and rachaelhartleynutrition.com, as well as Christy Harrison’s podcast FoodPsych. They are all non-diet dietitians who are doing amazing work in the field of disordered eating. We are all on our own journey with our relationships to food and our bodies. Thanks for sharing this! The recovery process is so humbling, but these setbacks can remind us why we need to keep working to represent the values we hope our children will hold. Hi Hillary, Thanks so much for sharing the dietitians recommendations! I’ll look them up for sure. I find the topic area of intuitive eating and body positivity to be so inspiring. I wish you all the best with your health and recovery! I can relate to the food allergy issues & no longer miss gluten at all, actually when I think of how ill it made me, it never even tempts me! Not even pizza, my fave before! What I wish is that you had a version of these without the oil & sugar. I can subst applesauce for oil, so will try that. I do not use sugar, only maple syrup & stevia. Any suggestions for replacing the coconut sugar (I also cannot have coconut due to it’s negative effects on cholesterol. Have managed to reduce this with Red Yeast Rice, so do not have to take statin…yay! But coconut somehow causes the body to produce more cholesterol, unfortunately. Plus I have to be diligent with my weight, just a lifelong problem well controlled with my healthy, WFPB diet! Despite my health issues, I am still able to cook…big YAY! That’s so wonderful you’ve found relief with some food allergies! I’m sorry I don’t have a version of these that you can make, but I’d love to hear what you come up with. I can’t wait to give this recipe a try :) It looks so yummy! I really enjoyed this blog post, especially because I’m ALSO going down the road of a food elimination diet. I’ve recently had a few nasty allergic reactions to food, and my doctor has recommended keeping a food journal and trying a food elimination diet until I can get allergy tested. I live in Ottawa (Ontario) and the wait time for allergy testing is 6 months! Is there a particular resource you used/looked to, for how to do safely/properly do a food elimination diet? I’m at a total loss for where to begin here. Any recommendations would be MUCH appreciated. Hey Angie, Sorry to hear you are dealing with allergies! After months and months of trying to fix my issues on my own (a la Dr. Google…lol), I finally set aside my stubbornness and went to a naturopath. This is where I had the food sensitivity testing done and from there I cut out the “highly sensitive” foods on the list for a couple months and I’ve been gradually reintroducing them. As it turns out, my issues weren’t solely food related like I thought. 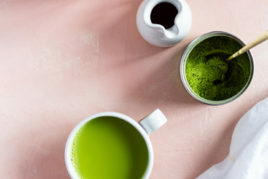 My naturopath explained to me that various hormonal imbalances can actually cause reactions to foods so it’s important to look at the “whole picture” when treating these things. I hope this helps…wishing you all the best! I feel like what you are going through with your health is so relevant in other people’s lives as well… including myself. I have tested positive for MULTIPLE food intolerances a couple years ago (and so has my teenage daughter) and it has made for a difficult and frustrating journey of figuring out what to eat everyday! Thankfully, we turned to your recipes and have found incredible joy in eating delicious food that doesn’t react with our bodies. Thank you for being open about your health struggles, we share with you in what seems like is becoming epidemic and the more we speak out about it, we create awareness for others. I’m sure many environmental factors are playing a part! 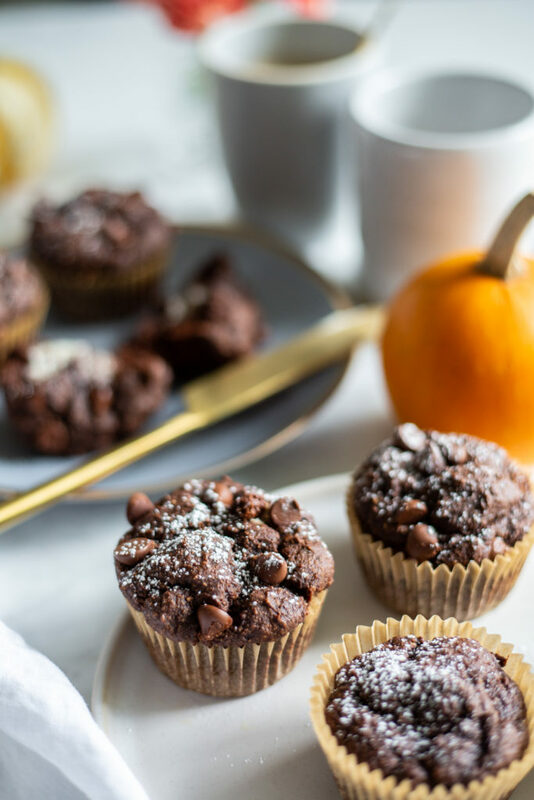 By the way… I made these delicious muffins yesterday and they are TO DIE for! So tasty with a hot coffee on a chilly day. My husband and I may have hid them from the kids, lol. Hey Lisa, I’m so glad you made these muffins already and enjoyed them so much! I agree they are great with a hot coffee…there’s something awesome about that chocolate-coffee combo. :) And thank you so much for your kind words…it’s always scary talking about these things, so to receive this kind of support is so, so appreciated. Hi Amber, thank you! That truly means the world to me :) I hope you love the muffins! Thank you for all your transparency and perseverance – can I ever relate! One thing that helped me on a rotation diet was making small magnetic strips of every plant-based food that I COULD eat, along with days of the week. I’d move them around on the side of my fridge to keep track, and it help me feel less deprived to see all my options. These look great! They have more sugar than I would normally allow myself (autoimmune no-no for me), but I’m going to a women’s church gathering and these sound perfect! Do you think they would work as mini muffins with a little icing for a dessert? That’s such a great idea! I can relate to making a list of foods you CAN eat…I was doing that too when I was in the really restrictive phase (luckily I’m not right now) and it did help a lot. :) I think mini muffins with frosting would be great! You’d want to adjust the bake time as they wouldn’t need quite as long to bake. Are these ok on the counter or do they have to be refrigerated after they are made? So looking forward to surprising my family with these. I have one vegan, one gluten free and one refined sugar free family members and they are going to love that all three of them can enjoy the same food. going to try making this over the weekend. thank you for sharing all of your delicious recipes! What a sweet idea to surprise your family, Debi! I hope they’re a hit. :) Thanks for your support! I just made these according to the recipe above and they turned out wonderfully! My family is going to be so happy with their afternoon snack! Thank you, as always, for another solid go-to, Angela. Wishing you all the best in your journey to health! Hey Melissa, thank you so much for your kind wishes! I’m so happy the muffins were a hit. I hope your family loves them too! Thanks Ruth, I’d love to hear what you think! Thanks Christen, so glad you like it! I just pulled these out of the oven and they are AMAZING. I am vegan and my hubby has celiac disease so we don’t attempt too many baked goods, but these turned out perfect! I also lucked out and found a pumpkin spice blend at Trader Joe’s this morning. Aww so glad they were a hit! 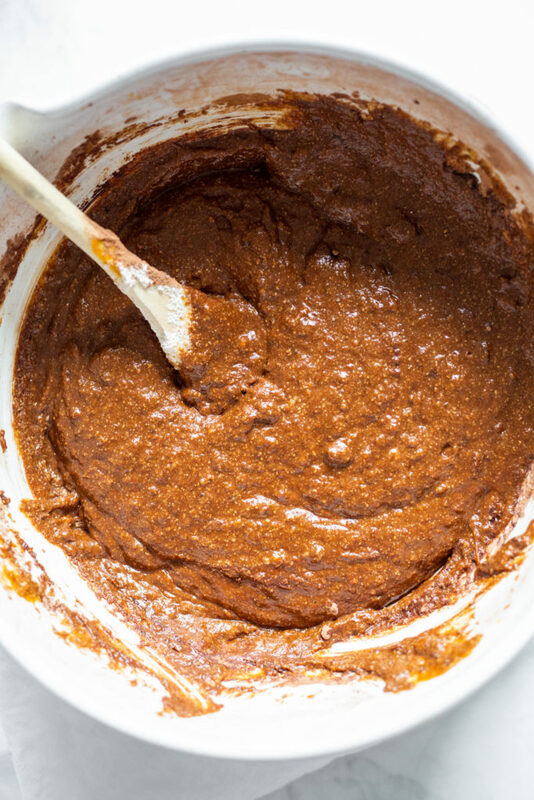 And I agree, those pumpkin pie spice blends are so handy. Hey Chloe, thank you for sharing, I haven’t heard of NAET before. That’s so great your little one got relief! This looks amazing! Call me crazy but the photos you posted with the recipe looks like it has a cream-filled center. Does it? Did I miss something? I can’t wait to try these. Do I need to put chia seeds in grinder (I don’t have one) or food processor? Hey Melissa, I grind them in my Vitamix (I store a small bag in my freezer so I always have it on hand), but I’ve heard you can do it in spice grinders too. I’m not sure if a food processor will do it or not! I wonder if it would break them down enough. I also have a ground flax option in my tips if that is more convenient! Oh I feel you here sooo much and wish you well on your recovery. Food issues can be a real mindboggle. I was diagnosed with celiac disease a couple of years ago but then had big issues with some of the GF alternatives. I wanted to chime in on the oats – the Canadian Celiac Association has great detail but certified oats are GF although some people (especially recently diagnosed) may not be able to tolerate. Yes they sure can….I’m sorry to hear about your celiac disease. I can’t imagine what a huge life overhaul that would be. Thanks so much for the tip about the CCA too! I’ve been bemoaning my, “I can’t eat anything” saga, myself, thanks to an elimination diet here, too. What am I missing so much? Bakery!! This will be getting printed and baked! Hey Kathy, I love that…doesn’t it feel so nice to just dig in bake something special sometimes? I hope you love the muffins! Sending lots of healing vibes your way. Hi Ellie, Thank you so much for your support! It means the world to me, and I’m so grateful that you’ve enjoyed so many of my recipes over the years. Hugs! I have been reading your posts on Oh She Glows for the last five years and I can’t thank you enough for changing my relationship with food and cooking. Your recipes inspired me to get back in the kitchen and connect with real food. You first cookbook is well used in my home and I have gifted it to almost everyone I know. I have a 2 year old and a 4 year old so your pregnancy and motherhood posts resonate with me on a deeply personal level. I appreciate your ability to be raw, honest, funny, and genuine in your writing. Since I stopped breastfeeding my daughter about a year ago my hormones have been out of balance. This has caused many digestive and health issues which in turn have affected my relationship with food and exercise. My faith in the medical system has waned over the years so out of desperation I turned to a team of naturopaths to help me. After having a food intolerance test I was devastated to discover 50 foods that don’t agree with me (many of which I consumed on a regular basis: cashews, almonds, wheat, rice, eggs, cheese and the list goes on). Reading your latest posts have given me hope and comfort in knowing I am not alone with what I am feeling and experiencing. Many days food feels like the enemy and has once again changed my relationship with food. Planning meals has become stressful and my passion for cooking is on the back-burner! I just want to thank you for connecting with me; it is strange to feel bonded with a complete stranger however the online community you have created is amazing. You are an incredible individual and I appreciate you and everything you have created. Hi Mel, wow…I can’t thank you enough for your kind words and for sharing your story (it brought tears to my eyes because I can relate so much!). It means so much to me to hear that my recipes have given you hope and inspiration. I can totally relate to how difficult and confusing it all can be, not to mention how much these things can trigger “food is the enemy” emotions which are so draining to deal with on a day-to-day basis. I was also in a huge cooking slump for a while there…it’s no fun when your passion is taken away from you (even temporarily). I hope that you start to see improvements soon and that you are back in the kitchen whipping up all kinds of recipes in no time! Sending you lots of healing vibes. Can I use a real egg in substitute of the chia egg? I really want to try this! Hey Betty, I haven’t tested it myself so I can’t say for sure, but I can’t see why not! I’m sure other readers would love to hear how it goes too. I’ve got these muffins baking in the oven. The smell is going to make my husband pass out when he walks in the door :) I am rooting for you!! Sending love along. Made these yesterday and they were fantastic! I did make a couple substitutions as follows: Instead of melted oil I used 1/4 cup of very finely grated zucchini. Instead of coconut sugar I used granulated monk fruit sweetener, and instead subbed about 1/3 of the oat flour out with almond flour. They were moist and full of flavor. Will definitely make again. Hey Sheila, thank you so much for sharing your swaps…what a fun idea to swap the oil for finely grated zucchini. Glad you enjoyed the muffins! These were DELICIOUS ! So easy, addicting and filling ! You did it again Angela !! I have made these on Monday. Put them in the freezer so we could grab one for our lunch. Turns out my boyfriend loves them straight from the freezer… and has been eating them for dessert. I’ll have to make another batch for next week, we are almost out!! Thank you so much for the recipe.! Oh that’s too funny! I’ve definitely had a muffin frozen and not sure I was a big fan of it, but when you’re hangry you’re hangry…haha. So happy you both love the recipe so much. Made this tonight! I forgot to add the pumpkin pie spice, so after three minutes in the oven, I carefully added some pumpkin pie spice to each muffin. It worked out fine! They are DELISH, by the way. Oh wow, nice save ;) I hate that panicky feeling when I forget an ingredient…sounds like you handled it better than I usually do hah. So glad you loved the muffins Christine! I had to make this recipe right away and it was BEYOND delicious!!! My husband went crazy for them too. Thank you! Hi Angela, made these delicious muffins for my non vegan sons today, they absolutely loved them! I’ll definitely be making them again, love your cook book to! Thank you so much for the nut-free recipes lately! These turned out wonderfully! I baked mine for about 32 minutes total, but maybe my liners were a bit taller than your average one? In any case, super delicious – thank you! My pleasure Laura! Nut-free is something I’m asked for a lot so I try to make sure the recipes have options whenever possible :) I’m so glad you loved the muffins! I made these this weekend (without the chocolate chips because I didn’t have any) and they are awesome! 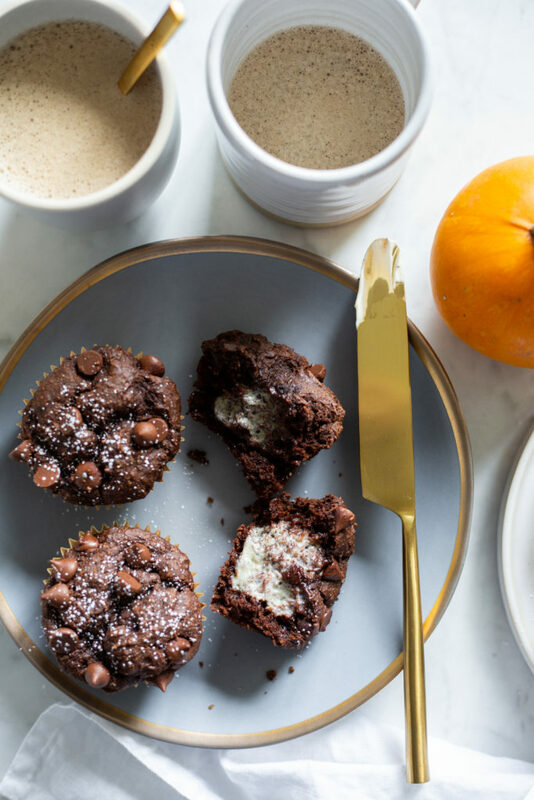 It amounted to 12 smaller muffins and have made for the perfect add on to breakfast or snack! I know it’s not easy to do, but I would recommend cooling completely before enjoying! Thank you so much, Angela! Your recipes never disappoint! Definitely not easy to do ;) Thank you so much for the kind words, too. I’m so happy you love the muffins! I have made these twice now, the second time doubling the recipe (that uses up the can of pumpkin puree;)). They are delicious! Moist and full of a nice spicy flavour…Only qualm about these is that with the amount of sugar, maple syrup and oil that perhaps they should be called a cupcake? ;) Suprisingly though they do not come off at all as too sweet, so reluctant to reduce sweetener amounts…Wondering about subbing some applesauce for some of the oil on the next batch – definitely will be doing another batch! New fall muffin favourite. Hey Suzanne, One thing I love to do with my baked goods is to use the least amount of sweetener I can while still making the baked good taste amazing!! 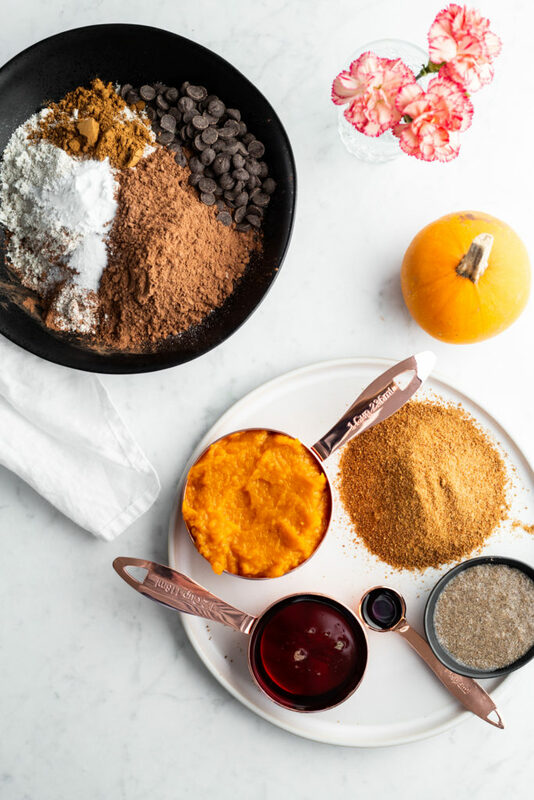 So I too was surprised by how much sweetener I felt these needed until all the flavours popped….but I’ve found that when using a lot of pumpkin like this recipe does (a full cup! ), it’s needed to balance out the squash and bitterness of cocoa powder. One way you can easily reduce the sweetener is to omit the chocolate chips…I do this all the time and it’s a bit more respectable as a breakfast or snack. ;) Of course you can reduce the sweetener too, they’ll just taste a bit more bitter. Hope this helps and I’m so glad you enjoy them so much! Would 1 egg be right amount to sub for the chia egg? Hey Marilia, I haven’t tested it myself so I can’t say for sure, but I can’t see why not! I tried it with 2 eggs and it turned out great. Thank you so much for sharing Lilian! It means so much to me to know that others have struggled with the same things before. It can be such an isolating experience! I really appreciate your support. And yes….it’s such a good feeling to get back to that celebratory feeling with food. I’m getting back to it week by week and I’m even more grateful for it now. In my experience, pregnancy aggravated my mild food allergies. I do believe, as you wrote, hormones have a lot to do with it. Histamine itself is a hormone, necessary for digestion and many other functions. There are plenty of blogs about histamine intolerance and I recommend reading a little bit about this subject. Even if it’s not the specific issue that you are experiencing you will find tons of food lists that have all kinds of micronutrients that help your body process and lower its natural histamines, which are probably spiking if you’re having allergic reactions. For me a light salad of Arugula, Apple, parsley or cilantro, cucumbers and onions (if you’re in the mood) can be healing and soothing when I’ve had a bad reaction. These foods (and lots more) all have great therapeutic qualities. Maybe some of them will even inspire some new recipes. Thanks so much Charlie! Isn’t it amazing how interconnected the hormones are in the body? I find it so interesting to read about! I love the sounds of that salad too. These are decidedly delicious! I wasn’t sure how the chocolate and pumpkin spice would work, but it’s a lovely combination. I brought a double batch into work and they went very quickly (and received rave reviews)! Whohoo, awesome news! Lucky coworkers ;) So glad you all loved them. Chocolate with pumpkin what a delicious combination! Looks yummy. Could I adapt this recipe to make a cake? Hey Sara, It would be a dense, brownie-like texture, but if you don’t mind that then I think it should work okay. I made it into a loaf and it worked well! The only thing I don’t know is bake time….my guess is 30 to 40 minutes depending on how thick the layer(s) are. Keep checking every 5 minutes until a toothpick comes out clean. It seems like they are very tasty. I will defiantly make this for my daughter. What a great post! I also struggle with disordered eating and it is a constant battle but I am getting better as I move towards a more normal way of eating. Good luck to you on your journey. This recipe looks amazing and something to try on the kids for sure! Thank you Amy, I appreciate it so much. I’m wishing you well on your journey too! Have you heard of Medical Medium? I think you could really benefit from his information. He has healed hundredths of thousands of people through simple things like celery juice every morning. This recipe is delicious! The taste/texture are exactly how you describe them. I made it the way the recipe is written, did a loaf, and the whole family loved it. 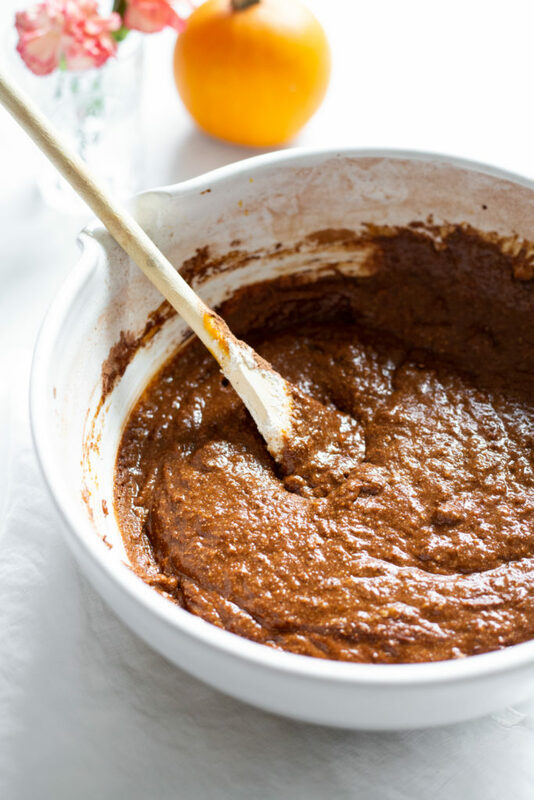 I’m thinking of making it into a chocolate cake for my daughters birthday (without the pumpkin pie spice) I was going to double the recipe and do two layers. Any thoughts on baking time? Hey Leila, I’m so glad the loaf size worked for you! That’s a fun idea about making it into a double-layered cake. I haven’t tried doubling it before so I’m not positive it would work (sometimes baked goods are funny when doubling)…I would probably suggest doing a trial run first in case it doesn’t work. As for bake time, I would guess they’d take anywhere from 30 to 40 minutes depending on how thick they are, but I’d check the layers every 5 minutes or so until a toothpick comes out clean. I’d love to hear how it goes if you try anything out! 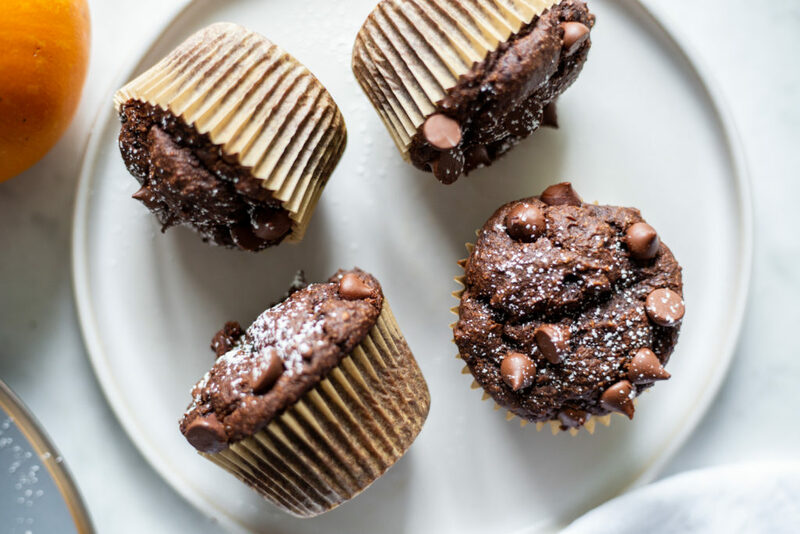 Hi Angela – I just had to comment on these muffins, they are heaven! Seriously, so good! 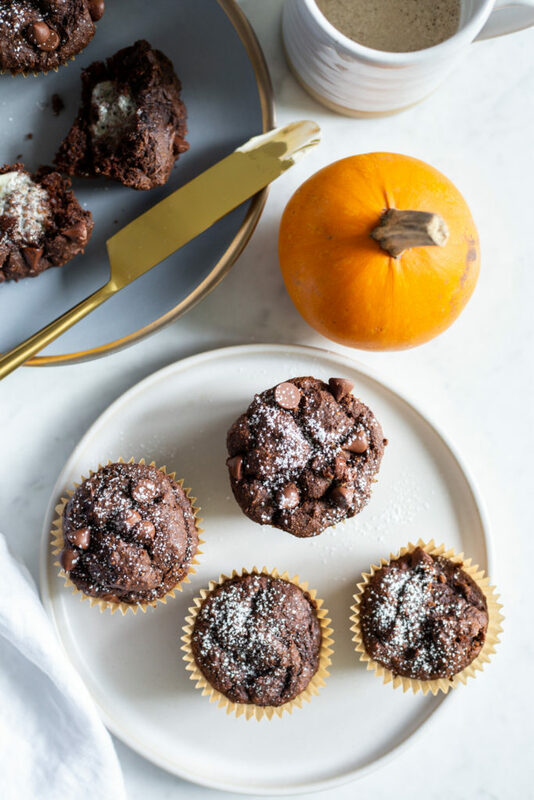 I was wary about the chocolate/pumpkin combination, but it is so indulgent and delicious. Love how moist these muffins are and not too dense, but oh so satisfying! I’m already on the second batch while pumpkin is in season! Super huge thumbs up on these! “There’s no shame in struggling with things you thought you’d beaten”: AMEN!! Needed to hear that today! 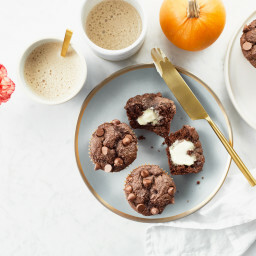 It’s a rainy Nor’easter Saturday and I wanted to make some fall comfort goodies without having to go out to the store. I made these with a LOT of substitutes because I was missing ingredients: 1 tsp lemon juice instead of baking soda, 1 tsp of dark rum instead of vanilla extract, I only had enough oats for 1 cup so I added 1/2 cup of spelt flour, I used brown sugar instead of coconut and I only had a chia/flax mix so I used that, 2 tsp and eyed the appropriate water. I whipped it all up, threw it in the oven hoping for a little miracle and I got one! They are AWESOME! I can’t wait to make them the real way!!! WOW, I had my fingers crossed reading your review hoping they worked out! haha. So glad to hear that they did. :) We’re getting that rainy weather too and I’ve been all about the cozy recipes. So…I went to make this and I am SUCH a mess today! Dropped baking soda all over the dog, forgot I had broken my muffin tin, didn’t have maple syrup, went to sub maple with mashed banana because that’s all I had and dropped said peeled banana on the floor… Am I the only one who has those days? Haha. Regardless, I persevered and made this into “bars” in an 8″ x 8″ pan and it was fantastic! :D Awesome recipe! haha I sure have those days!!! A couple weeks ago I dropped a huge 1 litre bottle of maple syrup on my counter…it smashed into a million pieces and I have sticky maple syrup and glass all over my kitchen. :( I’m so glad the bars worked in an 8×8 pan…great idea! This is one of the best recipes I have made and I have made many. I even fooled my daughter and didn’t tell them they were pumpkin and she loved them. She is very difficult to please as she is a very picky eater. I was surprised as to how moist they were. I couldn’t stop eating them. Thank you for such a wonderful recipe. I will be making these over and over. Have you tried the muffins with banana or blueberries? Hi Ana, Wonderful news…thanks for letting me know! I can never seem to stop eating them too. ;) I haven’t tried with mashed banana or blueberries but I definitely want to! It seems like it could be a nice base. I was thinking chocolate with mashed pear might be nice this time of year too. Can you use regular organic wheat flour? 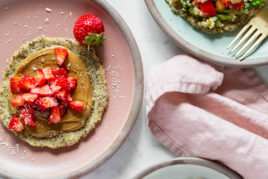 Hi Victoria, we did a version using the same amount of whole-grain spelt flour and it didn’t turn out, so I’m not sure aout swapping the flour. It would likely need experimentation…my guess is that you’d need to use less flour called for since wheat flour is so drying. 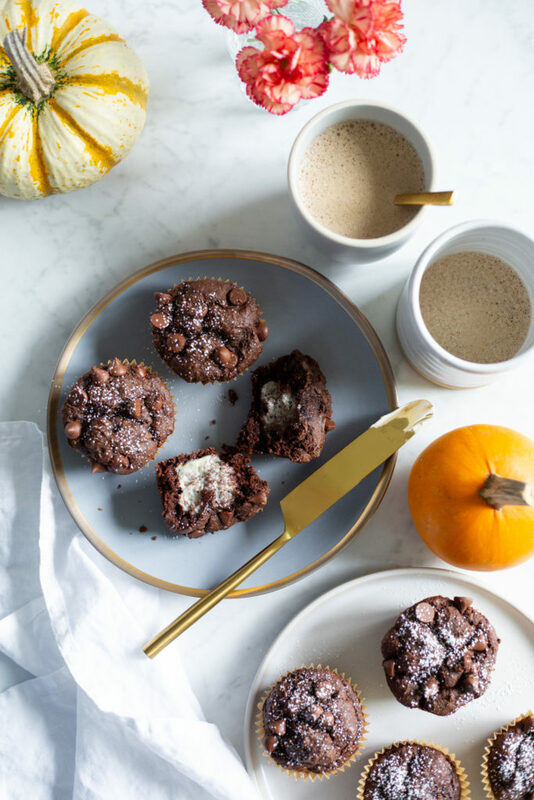 I was wondering the same about the chocolate-pumpkin combo…so happy you love these too :) Now I’m thinking I need a chocolate version of my fave pumpkin spice latte! These are killer. FWIW, I’m obsessing on protein so added 1/4 c hemp protein and 2 T water—still turned out great, and kicked the protein to 5 g/muffin. Thanks so much for the recipe! Oh my gosh, these are SO good! I just ate one warm out of the oven for dessert. I made it with one egg instead of the chia egg, omitted the chocolate chips, and used walnuts. A keeper for sure! Hey Jen, Thanks for your review! I’m thrilled you love them so much. :) They’ve been on a constant rotation in this house along with my banana bread for the kids (who don’t like chocolate). 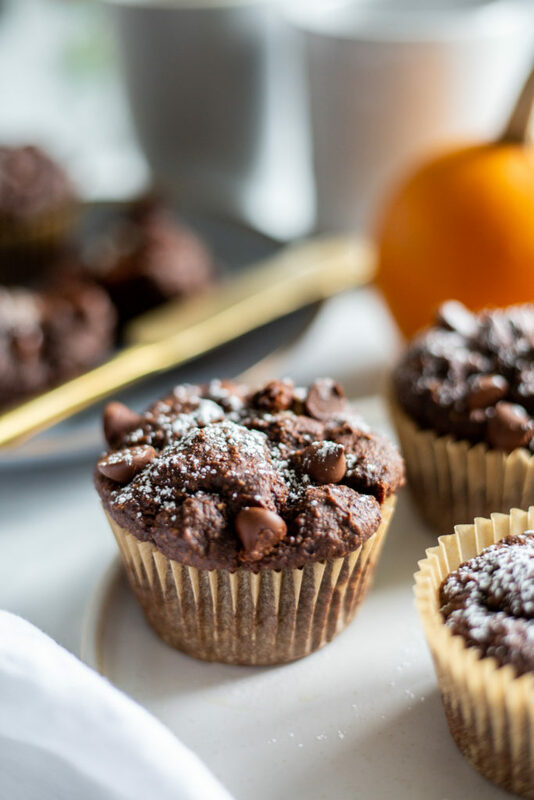 These muffins are absolutely delicious. I have made this recipe 4 times already. My kids devour them. I cannot say how much my family and I enjoy all your recipes (I have both books that I use very often). I hope there will be a 3rd cookbook in the near future! Hi Barb, If you’re looking for the nutritional info I provide that near the bottom (click the plus sign), and it tells you carbs and protein amounts per muffin. I decided to bake this recipe as cookies. The only thing I did differently was add sea salt caramel chips and greased a cookie tray. I baked them for about 20 minutes, which is longer than I normally bake cookies for. They came out moist and similar to a muffin top. I will definitely make these again as cookies, muffins, or a loaf. What a fun idea…thanks for sharing with us! Made a batch of these (made them into mini-ish muffins -the IKEA muffin pan size) and brought them into work… great reviews from everyone… even my boss! So moist and delicious! I LOVE this recipe! I never comment on stuff, but have to say… I’ve been so thankful for your blog over the past couple years. Your recipes have been the biggest place where I have found foods and treats that don’t leave me feeling deprived. I come from families that can cook and especially bake (the German side🙂), and can honestly say we’ve enjoy many of your baked goods even more than others I grew up on in the past. I also have a history of eating disorders, and started going through a lot of health issues/negative reations to food leading up to finding out I was pregnant with our son… which seemed to worsen my reactions. I was seeming to react to everything, and was eating an extremely healthy food protocal. I finally took an allergy test, and over 35 things came up as reactive foods, allergies/sensitivities. And it’s still an ongoing/always changing struggle. My toddler was also just diagnosed with Lyme disease (one of the main things I’ve struggled with). I’ve found it even to harder to find foods he will eat, while avoiding allergy foods his Pediatrion who also specializes in Lyme is telling us to steer away from. Sorry for the book of a comment… and also to hear of all your personal struggles. But please know that the parts of your story you’ve been willing to share, diligence and creativity has been so encouraging, helpful probably more than you can know! I feel weird for saying this, but finding foods that I’ve been able to eat and enjoy (and make for my family) at times when I’ve been the sickest and struggling the most, has even brought hope in a sense to keep working through it all. Hi Katrina, I can’t thank you enough for your lovely note! It means so much to me to hear that you’re finding passion with food again through my recipes, and that they’ve been a bright spot during a challenging time. I can relate a lot to what you wrote…I too have been finding joy with food again after going through health issues this year and it feels so good. I wish you and your family healing vibes and continued progress! I don’t use the chocolate chips, as I don’t like chocolate chips in already chocolate-flavored things, but I add a fistful of pecans and YUM. Pecans is a great idea :) Thanks Christine! A heavenly luscious recipe! Definitely a must try. Thanks for sharing. WOW these are so delicious, thank you!!! I made them last week. They are so moist and perfect! I used ground flax instead of chia. I will be making these again! Thank you Leah, that’s great you love them so much! Hi! Making these today. Could I use cacao powder or do I need cocoa? Thanks! Hi Jen, I haven’t tried it, but I can’t see why it wouldn’t work! Hi Angela, Do you think Cassava flour may work as a sub for oat flour? I am grain free so oats are not an option for me! 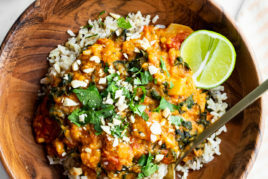 Hi there, I have had a tricky time using cassava flour in my vegan recipes…I find its flavour and texture can overpower quite easily so I have best success when it’s combined with other things. I feel like it could be too gummy or dense for these muffins, but it’s just a guess. If you try anything please let me know how it goes! Hi Angela. my mix was super thick, your photos show a supple one so I added half a cup of almond milk….but the oat flour (i blended my own) drank it and went back to super thick. The muffins, being so heavy did not rise at all. They are delicious however. Any idea of why this happened? I have never baked with 100% oat flour before, i might go back to my trusted spelt as gluten is not an issue in the household…and thank you for your recipies, i love them all. Hey Christine, I’m sorry your muffins didn’t quite turn out! 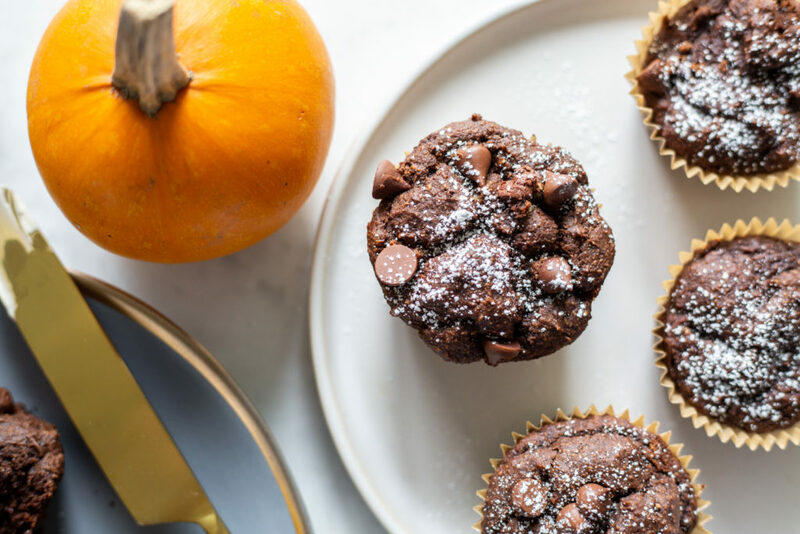 This recipe is definitely meant to yield a dense, gooey muffin, so the batter will be quite thick either way, but they should also rise beautifully. You could try making them again and weighing the ingredients for more precision and following the recipe exactly as written. If you do try the spelt flour, be sure to check out my note in the tips section. :) I’d love to hear what you think if you try the spelt swap! Hi Elina, I think cane or brown sugar should work fine though I havent tried it yet! I tried this recipe and made a few substitutions. I omitted the maple syrup entirely and only limited the oil to a teaspoon (filling the rest w/applesauce). It still turned out rich but a little dry. I wonder if adding a little oat or soy milk would help w/such substitutions. Hi Kimberly, Thanks for letting us know about your swaps! I’d love to hear what you think if you try the recipe as is. These turned out perfectly (made them with an egg instead of chia). Gorgeous, moist crumb, amazing flavor, and both of my kids loved them ( shocking, because they have wildly different preferences). Thank you for a great recipe! It’s definitely a big win when both my kids love something too (it seems so rare these days)….so glad the muffins were a hit! Thank you so much for the recipe! Even my non-vegan family members, whom I’m convinced to incorporate more plant-based meals into their diet, were impressed with the moist, chocolatey texture. I am so grateful for your website and your amazing repertoire of recipes. This recipe has quickly become a family favorite! We love it as is, and also love it with smashed banana in place of the pumpkin. Both ways are equally delicious 😋 Thank you! Oh I’m so happy to hear that mashed banana works as a swap. I have yet to try this but will be soon! Thank you Heather!! I appreciate you taking the time to let us know how it went! I thought the chocolate overpowered the pumpkin and left it with a strange aftertaste. With that said, the more I ate them, the more I liked them. My oldest daughter, who eats everything, couldn’t get over the aftertaste. But my little ones (2 & 3), who don’t eat anything, seemed to like them. I also liked that they were so soft, but they are better eaten with a fork. Too crumbly for a grab-and-go. 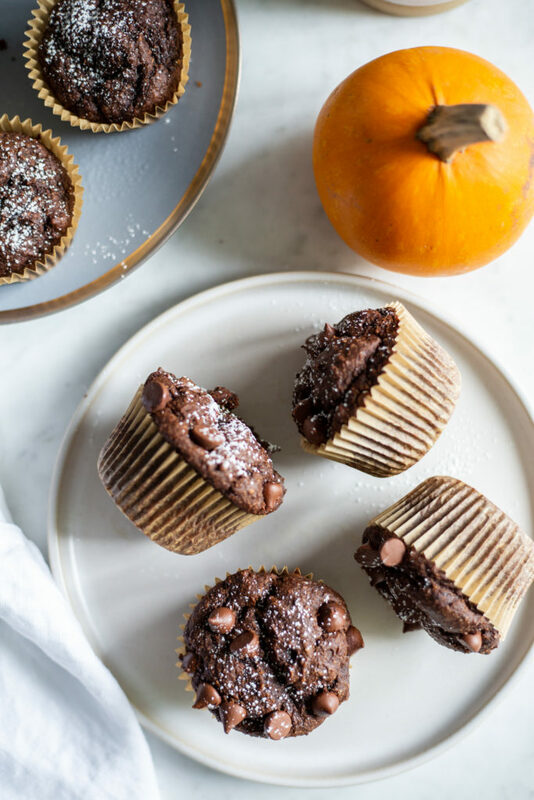 I’m interested to see how they would taste as a pumpkin muffin without the chocolate. Hi there, Do you mind sharing your experience with the muffins? It’s hard to tell if you made the recipe or simply don’t like the sounds of them. Why don’t you just get a blood test for food sensitivities? Next post: Vegan Salted Peanut Butter Crunch Torte + 10 Years!